Sai requires you to go pretty heavy on artifact spells to get a major payoff – but once you do, he becomes almost a sort of perpetual motion machine. I like how he can be used in either fast artifact decks or slow ones, and in both cases add a dimension that they might not usually have: a source of more threats for the fast decks, and a way to close out a game when the slow decks are well on top. In the bigger sense of things, it hasn’t been that long since Unstable, so I feel the need to point out how well he plays with Contraptions like Gnomeball Machine and Tread Mill, too! Sai turns all of your artifact spells into a “buy one, get one free” deal, which is a nice deal for decks that rely on artifact spells and synergies. 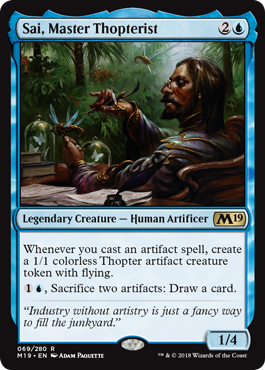 When all of your spells bring a free Thopter with them, they look a lot better, and Sai is a warm body until they come online. And after they’re useful, you can turn them into more cards. He’s not a flashy card, but a bit of engine grease in a deck can be welcome.